2008 EVOKE The Rymer Gallery, Nashville, TN. 1995 NATURE RECONSTRUCTED: NATURE REMATERIALIZED The Minneapolis Foundation, Minneapolis, MN. Koeppel, Fredric. "There's bliss beyond the horizon in Susan Maakestad's joyous "White Out", The Commercial Appeal, April 4, 2016. Jones, MiChelle. 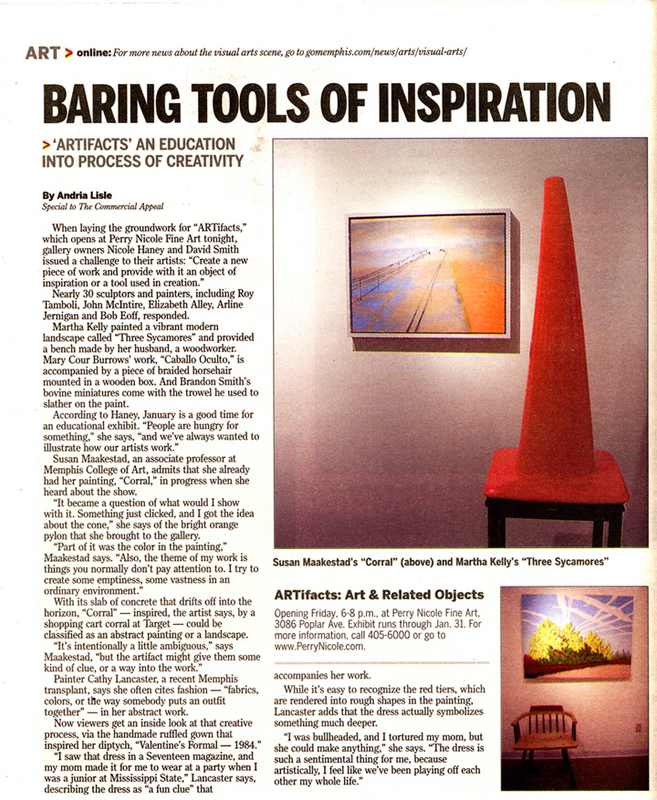 "The Rymer Gallery shares views of the open road as envisioned by Tennessee artists", The Tennessean, February 14, 2013. Wills, Betsy. 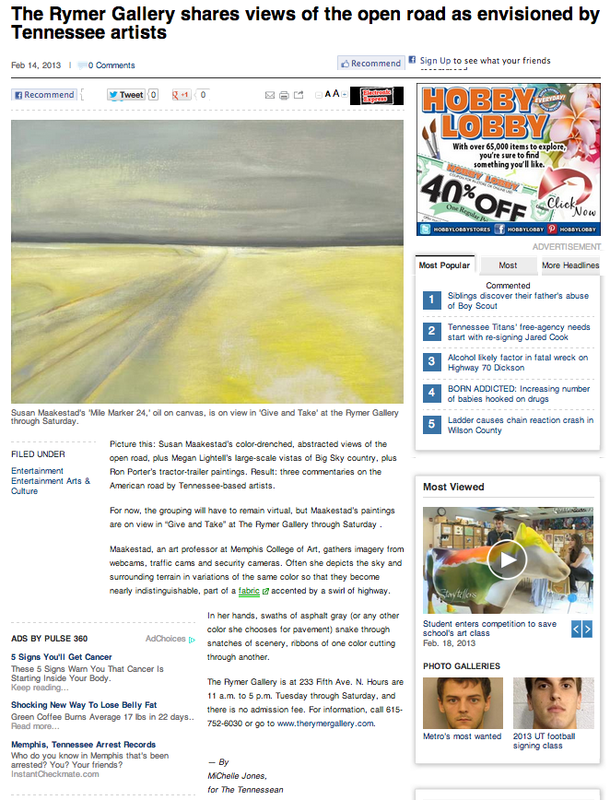 "Local Color", Artstormer blog, May 23, 2012. "Crossroads: A Shifting Landscape." Exhibition catalog. View catalog essay. Walsh Gallery at Seton Hall University, February 2012. Eagan, Corianne. "Memphis artist to talk at Yeiser." The Paducah Sun, July 29, 2011. Koeppel, Fredric. "Abstract canvases hold glimpses of endless highways." The Commercial Appeal, March 26, 2010. Koeppel, Fredric. "Memphis College of Art staff showcases the artist within." The Commercial Appeal, October 9, 2009. Knowles, Carol. "Go Deep." The Memphis Flyer, January 22, 2009. Lisle, Andrea. "Baring tools of inspiration." The Commercial Appeal, January 9, 2009. Knowles, Carol. "Back to basics: works at On the Street and the Dixon." The Memphis Flyer, October 9, 2008. Knowles, Carol. "In with a bang: January shows span 40 years of Memphis art." The Memphis Flyer, January 24, 2008. Koeppel, Fredric. 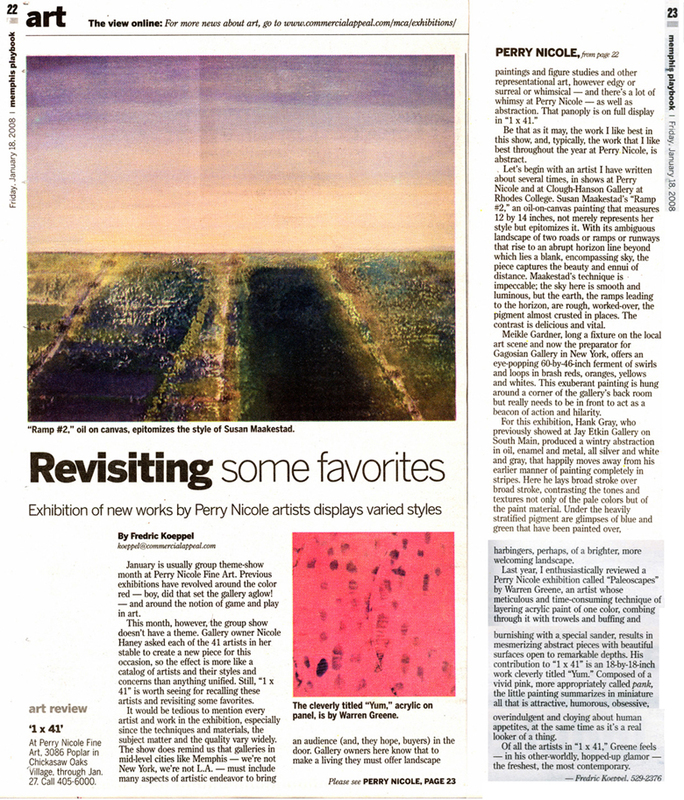 "Revisiting some favorites: Exhibition of new works by Perry Nicole artists displays varied styles." The Commercial Appeal, January 18, 2008. Howe, Alyce. "Maakestad portrays urbanism in a new light." The Purple and White, November 1, 2007. Koeppel, Fredric. "The year in fine art: critic narrows the field to eight exhibitions at local galleries and musuems." The Commercial Appeal, December 29, 2006. Knowles, Carol. "Riders of the Storm: Local art in 2006, signs of the time." The Memphis Flyer, December 28, 2006. Knowles, Carol. "En Route: two artists at Perry Nicole take us for a ride." The Memphis Flyer, November 23, 2006. Koeppel, Fredric. "Urban Fragments Isolated in Artist's 'Abstractions'." The Commercial Appeal, February 17, 2006. Knowles, Carol. "Space Travel: Inside and Out of the City Limits." The Memphis Flyer, February 9, 2006. Knowles, Carol. "True colors: seeing red at 'Red Show'." The Memphis Flyer, January 27, 2006. Koeppel, Fredric. "'Red Show' needs blue pencil." The Commercial Appeal, January 13, 2006. Maddox, David C. "Everyday Scenes: Two Painters Who Render the Banal in Distinct Ways." Nashville Scene, March 24, 2005. Hall, David. "Wet Paint." Memphis Flyer, May 23, 2002. Dobbins, Hamlett. 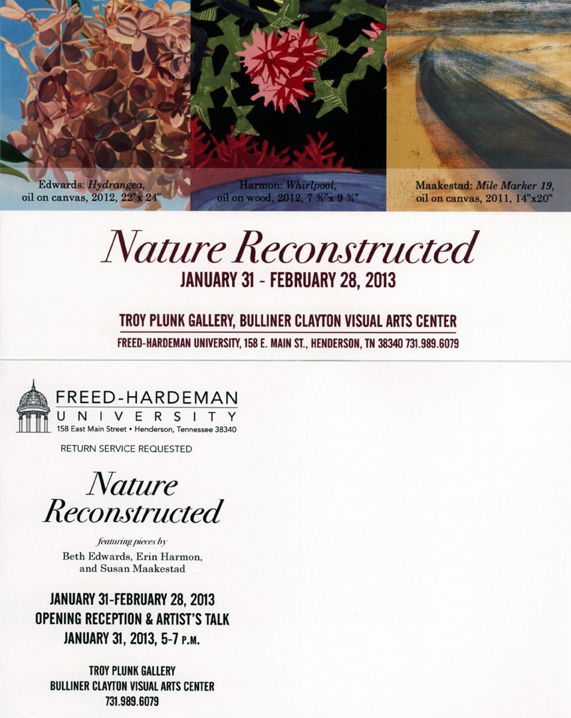 "Susan Maakestad: Landscapes." Dateline Memphis, September 30, 1999. Meyer, Deborah Raenette. "Two Women, Two Natural Visions in Oil." Chapel Hill News, November 21, 1997. Silberman, Rob. "Second Round of Area Gallery Exhibits Attract but Retreat to Ordinary Values." Minneapolis Star Tribune, November 3, 1995. Sult, Amy. "Painters Show Similar Interests, Different Results." Kalamazoo Gazette, September 17, 1995. Moehl, Karl. "Contemporary Visual Art Invitational." New Art Examiner, April, 1992. Moehl, Karl. "24 x 24: Small Paintings by Six Illinois Artists." New Art Examiner, October, 1991.